The Federal Reserve’s plan to keep raising interest rates could soon run into a wall of its own making: low long-term borrowing costs that signal expectations for weak economic growth and anemic investment returns for the foreseeable future. Why is the Fed to blame? It isn’t the only culprit, but the subdued economic recovery from the Great Recession and continued expectations for weakness stem in part from an insufficient, halting policy reaction to the deepest downturn in generations — both from monetary and, importantly, fiscal policy. 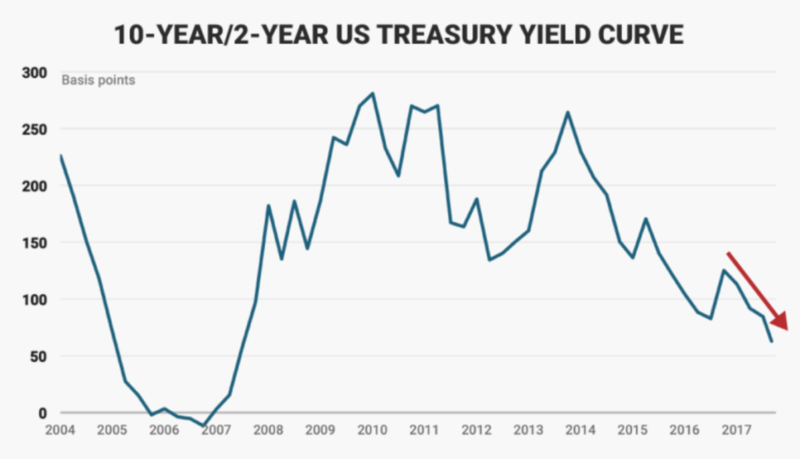 The US yield curve is now at its flattest in about 10 years — in other words, since around the time a major credit crunch of was gaining steam. The gap between two-year-note yields and their 10-year counterparts has shrunk to just 0.63 percentage points, the narrowest since November 2007. Philadelphia Fed President Patrick Harker appeared to corroborate the Bank of America analysts’ assumption in an interview with Bloomberg TV earlier this week: He said he was “concerned” about the flattening of the yield curve.